This tool allows you to manage different game configurations. 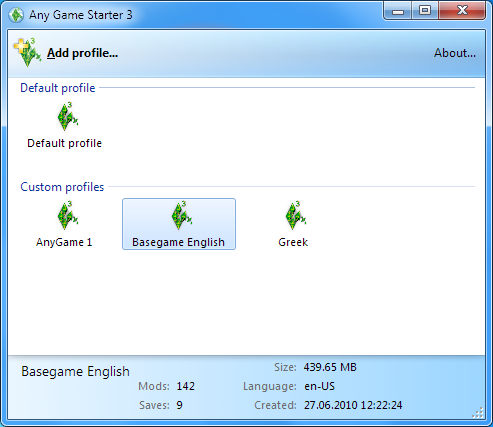 It will allow you to create new game profiles with separate language setting and different EP and SP configurations. Easily create content that requires only the basegame or only some EPs, so you don't have to worry about items from other EPs. AGS3 only runs under Windows, starting with XP. Windows XP users need the .Net Framework 2.0, if they don't have it already. It works in both 32 bit and 64 bit Windows. It is compatible with every game version and every EP and SP and it should be even compatible with future EPs, as it just reads the installed games from the registry. You need the patch 1.12 or Ambitions if you want to use different mods for each profile. AGS3 Version 2.1 needs Generations or patch 1.22. If you run an earlier game version you should use AGS3 version 1.3 or 2.0. It is meant to be used with the normal retail version of TS3, using the Origin version should work, too. I added experimental support for the Steam version, but I wasn't able to test this version and you will not be able to disable EPs with the Steam version. AGS3 has to fake a different environment for the game. Please try not to power off the computer while an AnyGame is running, although the actions are fairly safe and the program will restore the game configuration the next time windows starts, if needed. If your documents path is outside of your user folder (for example your user folder is C:\Users\John\ and your documents folder is C:\Documents\ or D:\Documents\ instead of the default C:\Users\John\Documents\) you should either not use AGS3 or at least be cautious because in this case the documents folder needs to be changed temporarily for all applications. AGS3 will warn you in this case. Advanced documentation about updates and development can be found in the first comment. If you want to update AGS3, you can install it on top of the old version. The installer is prepared for that and first uninstalling is unnecessary. If you have problems, don't simply uninstall AGS3. Give it a chance to repair the game setting first, simply by running it and maybe starting the default configuration. Rebooting your computer may also help. Please note that uninstalling doesn't remove your profiles. If you want to delete them, delete them before uninstalling, or delete the AnyGameStarter3-folder in your Documents folder after uninstalling. Before you report problems, please look at the FAQ in the first comment. When reporting problems, please always include the complete version text (for example "2.2/2.en-US") from the about window and the "game detection log" which is put into the clipboard when you hit the "Environment Info" button in the same window. You may want to send it via pm to me as it can get rather large and it may contain some information about the files on your hard drive. Numenor for the idea of the original AnyGameStarter. If you want to submit your own translation or improve an existing, feel free to pm me. This tool (except third-party-translations and some binary parts) is open source (New BSD License). You can download the source code here. If you want to submit patches feel free to ask me. 1139 people have said thanks to jonha for this download.